Life has returned to some form of normalcy after the end of the series, and so His Majesty Yuuri Shibuya travels to oversee how things are going. While doing so, he runs into the king of Small Shimeron--Sararegi. But it seems there may be something more to him than the friendly king he presents himself as. Next is a tournament between fighters, and then a machine that measures love compatibility. Things just never seem to go well for the young king...Yuuri go back to Shimaron to relax and meet some friends, when the "king" of Little Shimaron suddenly joins the group and wants the Maou to come to his country. The Original king sends a message to Yuuri's brother and his friend that Yuuri is in trouble. 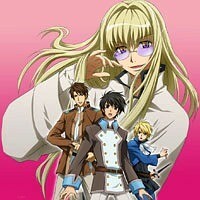 Watch Kyo kara Maoh! R Episodes Online at Animegg.org. Kyo kara Maoh! R is available in High Definition only through Animegg.org. Choose an episode below and start watching Kyo kara Maoh! R in Subbed & Dubbed HD now.